In the Book's CD, I haven't found any "Sounds" folder that is mentioned on chapter 7. I'm not so stupid to not look at the folder the book said me to look in. Not implying any stupidity on you man. There wasn't a Sound folder on my book's cd either. I listed the file path based on the purchased code, rather than the book's cd path. I should've clarified that first. I wasn't able to find a Sounds folder in the Chapter 7 project, or from the ZIP on the errata page. However, a search of the CD revealed that Chapter 15 DOES have a Sounds folder, and that has the attention, explosion, etc. sounds referenced on page 126. On the CD, the sounds are present, it is just the Content Project file isn't. The zip file in the errata page has the missing Content Project file and an updated Game1.cs file. So you should copy the filesfrom Chapter 7 from your CD onto your harddrive. Then you should unzip the Chapter 7 Fix.zip file from the errata page overtop of the existing files. This will give you what you need to actually compile the Chapter 7 code. To your point, Chapter 15 does include the Content project that has everything that Chapter 7 has plus some other items. 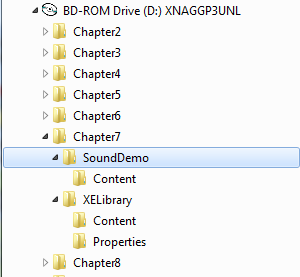 You could just copy the Sounds folder from Chapter 15 if you would like.